A warrior of physical and mental strength, Erik Killmonger slashes into battle with unrivaled intensity. One of the reasons that Deadpool was such an invigorating movie was that for once, the hero wasn't fighting his exact duplicate: in a world of armored suit vs. armored suit, enormous green rage monster vs. enormous green rage monster, god vs. god, supersoldier vs. supersoldier, shrinky guy vs. shrinky guy, Kryptonian vs. Kryptonian and even psychopath vs. pretty much anybody, getting "guy who can heal anything, but feels all the pain" vs. "guy who heals at a normal rate, but can't feel any pain" was a breath of fresh air. 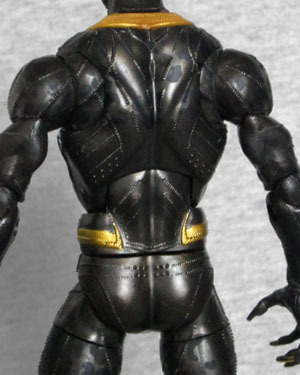 And now here comes the Black Panther toyline, making Killmonger look like "Blacker Panther." By now we trust Marvel enough to believe that there's more going on than it appears, but on the other hand... wizard vs. wizard. So we'll see. 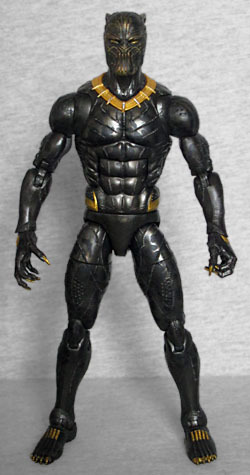 We already got one good look at the Black Panther costume thanks to Civil War, but this one dials everything up. The pattern on the suit is no longer a series of perfectly connecting lines - there are still lies, but they're broken up by gaps and accentuated by dots, giving the entire thing a sort of "ritual scarification" feeling. 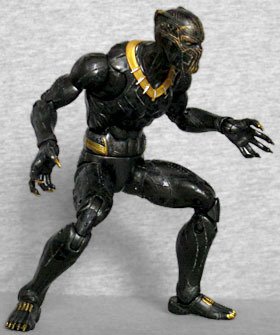 Like the normal Panther suit, this one has sharp claws on all the fingers, but it also takes things further, by trading the rounded toes of T'Challa's boots for clawed feet, as well. Everything about the costume just feels sharper and more vicious, which makes sense if it's the movie's villain wearing it. That especially carries over to the face. Rather than silver, all this suit's accents are done in gold - gold claws, gold belt, gold necklace, and fine, thin golden lines tracing all over the face, suggesting bared fangs. There's even a bit of a drybrushing on the forehead and temples. That, added to the dark charcoal grey of the suit (rather than actual black), makes this a lighter, brighter Panther overall. Like he's crackling with energy. If you look closely at the body, he's painted with spots, making him less like a panther and more like a leopard. The Civil War Black Panther figure moved quite well, but Killmonger is even better. He gets the usual assortment of articulation - balljointed head, hinged neck, swivel/hinge shoulders, swivel biceps, double-hinged elbows, swivel/hinge wrists, a hinged torso, swivel waist, balljointed hips, swivel thighs, double-hinged knees, and swivel/hinge rocker ankles - but he also gets lateral pec hinges, so he can either point both arms forward or spread them wide. And you'll want to, since he'll be brandishing weapons. Killmonger doesn't come with an alternate unmasked head, showing us Michael B. Jordan in his first comicbook role [No, he was in... --ed.] I SAID. IT'S HIS FIRST. COMICBOOK. ROLE! Ahem. While he doesn't have an unmasked head, he's not without accessories. The set includes a spear and a sword of some type, both detailed impressively in sculpt and paint. Since you can't hold weapons with open hands, he also gets an extra pair with the fingers curled more tightly. 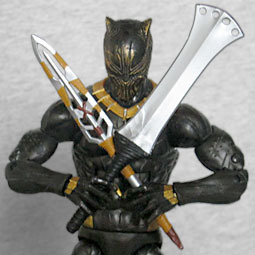 The Build-A-Figure for this series is Okoye, one of T'Challa's bodyguards, and Killmonger comes with the left leg. It's black, just like he is, but the particular shade is more blue than his yellow. While we'd have preferred to get Killmonger in his less-derivative "Jango Fett"-lookin' outfit, one of the things he always tends to do in the comics is try to usurp the role of Black Panther and the leadership of Wakanda, so maybe that's his play in the movie, as well. (We won't reveal the specific reason his attempts fail, because that might get into spoiler territory if the movie sticks close to the books.) Still, let's hope the non-Panther costume gets some love as well.